With the passage of time all things come and go, and none more so possibly than decent reference books. What we all read today - in 10/20 years or so from now - will become long out-of-print; yet being able to read them again today one finds certain books hold a great deal of viable reference material for flying boat enthusiasts, scale modelers and historians which is not itself time-bound. These books are a wonderful source of photographs, drawings, plans and details for us modelers and enthusiasts, yet the lack of availability is a serious drawback to the avid scale modeler or enthusiast. Too often they simply remain in individual's collections and were they to appear for sale might well be far out of the average enthusiasts price range. Yet, there is another way to have a copy for your private reference and home hobby use; a scanned pdf. With this gallery, I have attempted to save for posterity those books that are today out-of-print, yet are so worth saving for this - and future - generations to have the opportunity to save, read and treasure something that may well not ever have been available to them. If you have access to any old flying boat books, please consider sending scans (or the web location of a pdf) into SEAWINGS for inclusion here. Note also that there is no intention to add any book/publication that is ever likely - in my personal view at the time of addition in the first instance - to ever be re-printed and released on general sale to the public. However, were that to be the case at any time, any pdf already shown here will be removed immediately information presents itself to SEAWINGS. Packed full of details, 1/72 scale plans & photo's - written by the then 'A' team of authors, Heinz J.Nowarra, Peter G.Cooksley and Bruce Robertson - it is the WWI modelers reference 'Bible'. 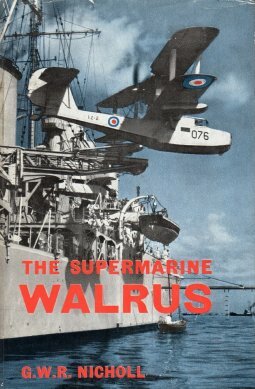 A very good read, packed full of contemporary details of the Supermarine Walrus telling the design and operational history in-depth. Good photo's too.